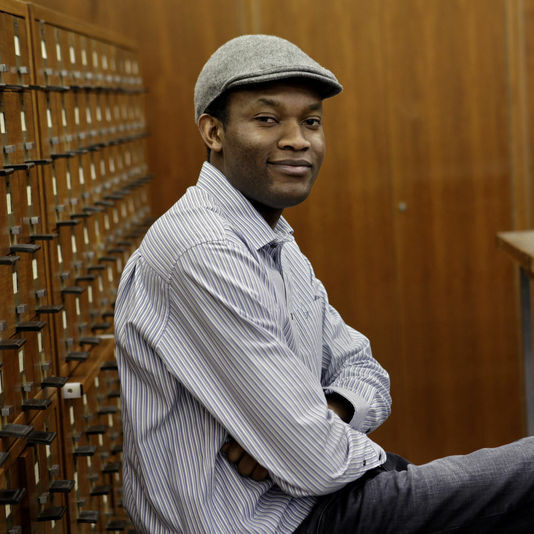 Tram 83 is Fiston Mwanza Mujila’s dazzling first novel. It follows an idealist writer named Lucien in an unnamed African mining town governed by global capitalism’s worst impulses. In the midst of a world reduced to chaos, survival and exploitation, Lucien tries to finish his grand oeuvre, a “stage-tale” entitled “The Africa of Possibility” and dedicated to Patrice Lumumba. The novel’s action occurs almost exclusively in a nightclub where child miners mix with striking students, rapacious Western businessmen, and women who are, in the words of one of the characters, “emancipated, democratic, and independent”. Mwanza’s vivid representation of this temple of intemperance and, more generally, of the human landscape in which Lucien must function, makes his novel a fascinating read that oscillates between gripping dystopia and humanist celebration. Tram 83 was published in French in 2014 and has already won several literary prizes in Europe. It is now available in English (translation by Roland Glasser) and translations in several other languages will appear soon. However, few Congolese writers works have been made available internationally; in fact the last time a Congolese novel was translated in English was 1993, when the DRC was still named Zaire. Mwanza grew up in Lubumbashi, Southeastern Congo’s copper capital. Lubumbashi is a city pregnant with difficult histories, where the wounds of colonial segregation overlap with the more recent memories of secession, dramatic economic decline, and the violence of politicized ethnic identities. It is also a cultural crossroad where artists have taken advantage of the great distance that separates them from Kinshasa to go where their own imaginations took them. Not coincidently, the city also claims the photographer Sammy Baloji (who happens also to be Mwanza’s cousin) and the baroque singer Serge Kakudji, two artists whose work have a brilliance and freshness that resembles his own. I recently talked to Mwanza on Skype in his home in Graz, Austria, where he has lived for several years. We discussed his novel, the recent protests in Kinshasa, and the new generation of Congolese musicians. You are just back from a long tour in the United States. How was Tram 83 received there? The reception of the book in the U.S. is not dissimilar to my experience in Austria. American or Austrian readers are obviously less familiar with francophone African literature than, say, readers in France or Belgium. This is actually quite refreshing, because people actually look at your text, at what you are saying, at your aesthetic, at your language. While in France, people are often interested in genealogies – “you write like so and so” –, which reduces the book to a form of ethnological reading. I also think there is a genuine interest in the DRC in the U.S. It might be because somehow the country has been at the center of the world since the Berlin conference. And even people who don’t know much about the Congo will still at least be able to relate to a few images. They will remember Mobutu, the Rumble in the Jungle, or some of our musicians. Tram 83 takes place in a fictional city that often evokes Kinshasa, Mbuji-Mayi or Lubumbashi. Yet, you situate that city in an unnamed African country, which is explicitly not the DRC. Why did you choose to employ geographical ambiguity? It is impossible to write about the Congo. It is impossible because it is a country that still doesn’t exist. It does not exist as a place of rights, as a normal state. It is also impossible to write about the violence in the Congo and its millions of victims. The only way you can write about this is by embracing extremes, exuberance, and poetry. And my novel is like a long poem. I wanted Tram to be able to represent a form of exploitation and neocolonialism that happens throughout Africa, not just in the Congo. Yet, the mining cities of Mbuji-Mayi and Lubumbashi, and their transformation since the liberalization of mining, were indeed my most direct sources of inspiration. Some reviews of the novel have missed its humanist dimension, which was crucial for me. The use of children in the mines, the women who prostitute themselves in the mines, the new slavery of the mines, I did not invent it. Even you or me, we can go to a place like Mbuji-Mayi today, rent a concession, hire ten miners and pay them in Monopoly money. The novel contributes to the understanding of these new wretched of the earth. Tram 83 does not only conjure the mining worlds of Central and Southeastern Congo. It is also an unforgettable portrait of the larger-than-life universe of Congolese nightlife, and notably of Kinshasa’s bar scene. The nightclub of your novel is a real pandemonium, a place where sexual exploitation coexists with hedonism, artistic creativity, and the emergence of new ways of making society. Do you think Congolese politics can be reinvented in bars and nightclubs? Politics is already happening in these places. Everybody knows that the most important decisions in the Congo are made at night, and not in official buildings. In my novel, people are going to the nightclub to talk about everything. The place becomes life itself, as well as its own country. It is a place that is both cruel and hopeful, where someone can be pimping young women while being the most kind-hearted person. You have people like that in the Congo too. And change also often comes from these very contradictions. Towards the end of the novel, the patrons of the bar – the students, the miners, the prostitutes, the profit-seeking tourists – all come together and nearly succeed in overthrowing the dictatorial dissident general who rules over the city-state. It is difficult not to notice the resonances with the recent mobilization in Kinshasa against the extension of Joseph Kabila’s presidency beyond its constitutional end date in 2016. What do you expect for the future of the Congo? I am actually rather optimistic. The protests of January show a change of consciousness among the country’s youth. Despite the violent repression that followed the protests, I think lot of hope comes from a new general awareness that the youth created by taking the streets. Chaos is a possibility, but it will not turn into a civil war. People feel that they have been deceived, but they still want change. And they want to participate in the construction of a legitimate state based on the rule of law. There is a lot of hope, but it also feels as if we were at the eve of a battle, a battle that could be the last one. Next year will be decisive for the country. People are mobilized and I think the government will fold. What is also happening, both in the Congo and in the diaspora, is a movement away from the world of beer and music that I describe in the novel and that has kept the Congolese youth away from the important questions. The boycott among the Congolese diaspora in Europe against Congolese musicians who have supported the current regime is part of that movement. What is your view of the music scene in Kinshasa today? The sonic environment of your novel includes jazz and rumba extensively, but not contemporary Congolese so much. I think you only allude once in passing to JB Mpiana’s horse dance. I listen to everything, from Grand Kallé to Fally Ipupa, and from King Kester Emeneya to Koffi Olomidé. But, in my opinion, there has been a decline in Congolese music that started at the time of Mobutu’s so-called democratization in the 1990s. There was a rupture with the era of the Francos, Rochereaus and Papa Wembas of Viva La Musica, when music was a serious business. Paradoxically, the democratization process introduced the cult of personality in Congolese music. Before the 1990s, what was important was the orchestra more than individual musicians: Empire Bakuba with Pepe Kallé, OK Jazz with Franco, Afrisa with Rochereau, Viva la Musice with Wemba, or Zaiko Langa Langa. Each of these orchestras had its own identity and worked as an institution. Today, there is an over-commercialization of music that has had a very negative impact on its quality. But don’t you think there are interesting things happening in the new generation? For example, Fabregas’ recent hit “Ya Mado.” The song is basically a quintessential emblem of Congolese popular culture: it warns the youth about the dangers of HIV-AIDS while launching one of the most sexually explicit dance moves of the year. In a way, the song is a good description of the constrained moral and social space in which the women of your novel are evolving. I think there are interesting things coming out of the new generation of musicians. Today’s music is very much like the country itself and its attempts to recover after years of political crises. There are weaknesses, but also reasons for hope. Next to songs of poor quality, you will also find real nuggets of gold. You only have to dig. You will not be disappointed. One among others to look at is Ferré Gola. I consider him Pepe Kallé’s heir. Fabregras, on the other hand, responds mainly to the market. He is giving consumers the type of dance moves they expect. He has the spirit of an animateur, with the culture of the hit single. He is thinking about how to get people to the dance-floor. And throwing in suggestive choreography will always do the trick. Yet, I don’t think that people will remember this song in five years, because there is nothing new in the lyrics. We are very far from the 1980s and 1990s when musicians were contributing powerful songs like Stervos Niarcos’ “Kinshasa-Brazza” or Dindo Yogo’s “Mokili echanger.” The lyrics of these songs helped people develop a sense of their collective history. This is the kind of cultural mapping that I am trying to emulate in my writing.